125 records – page 1 of 3. Aerial photograph of Burnaby north of Lougheed Highway. Aerial photograph of Burnaby with the Trans Canada Highway running through and the Forest Lawn Cemetary to the south. 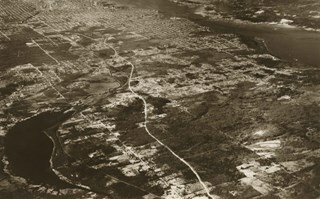 Aerial photograph of Burnaby with the Trans Canada Highway running from through and Burnaby Lake in the south east corner. Photograph of the "Roberts House" in its new location at 5496 Dominion Street. 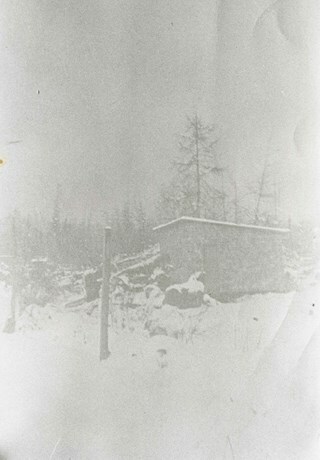 Note in blue ink on verso of photograph reads: "P.17"
Photograph of the first Boberg family home after a heavy snowfall, on Douglas Road in the Still Creek lowlands where the creek flows into Burnaby Lake. The Bobergs moved here in 1920. Photograph of the Boberg family home and farm on Douglas Road. Shown on the back porch, John Boberg (father) and Elin Boberg (mother) holding their only son, John, then 3 years old (born 1921). 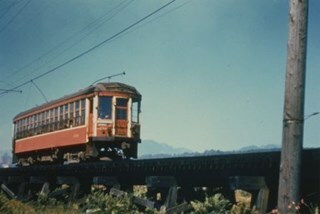 Photograph of Tram #1232 on the Burnaby Lake Interurban line, near Still Creek. 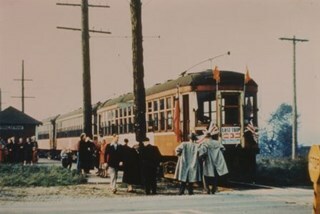 Photograph of the last trip for Tram no.1231 (and two others) on the Burnaby Lake Interurban line, as they arrive at Douglas Road station. Photograph of mold growing on a wall in a basement on Norland Avenue in Burnaby. The owner of the house, Jocelan Wise blames the mold and watermarks on a faulty storm sewer put in by the municipality in 1977. 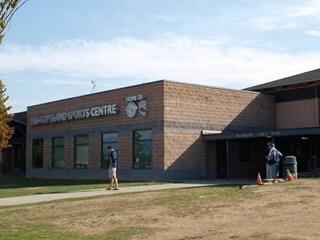 Photograph of the Bill Copeland Sports Centre. 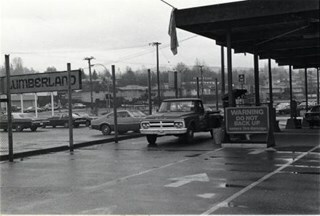 Photograph shows the parking lot for Lumberland at 5650 Lougheed Highway. 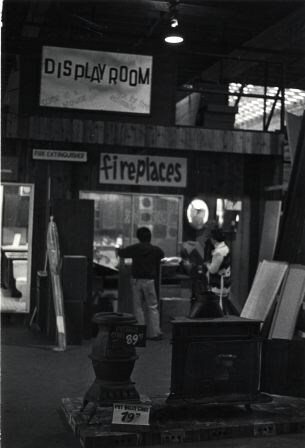 Photograph shows inside Lumberland at 5650 Lougheed Highway. 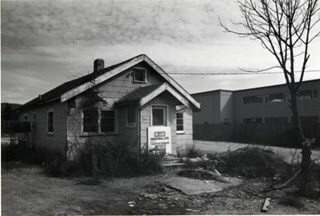 Photograph shows a vacant house at 2874 Norland Avenue with a sign advertising the property as an industrial site. 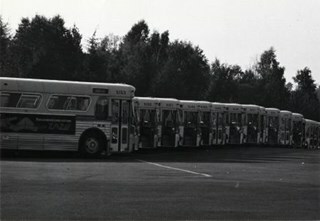 Photograph shows Hydro buses parked outside the bus garage at 6556 Sprott Street. 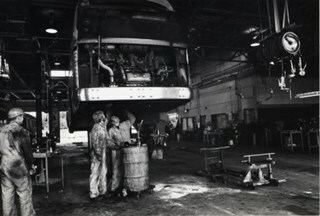 Photograph shows mechanics working on a bus at the garage on Sprott Street. The building was constructed in 1967. Photograph shows Still Creek from Sperling Avenue near Lougheed Highway. 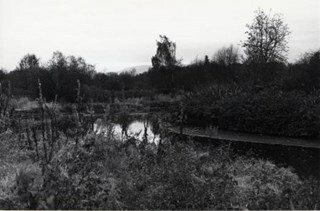 Photograph shows a view of underdeveloped area and the No. 1 Highway looking northwest from the Sperling Overpass with Capitol Hill in the background. 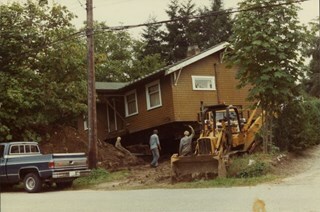 Photograph of Tom Irvine's house being moved to Heritage Village (now the Burnaby Village Museum). The house is being moved on a gooseneck trailer that has been hitched to a pickup truck. 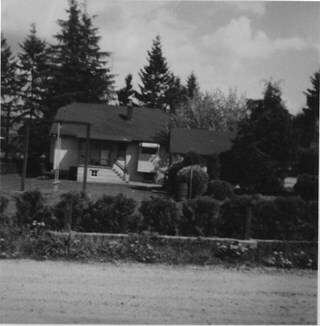 Note in pencil on verso of photograph reads: "April/75"
Photograph of the front of Tom Irvine's house in its original location on Laurel Street in Central Burnaby. Notes on slide mount read: "front porch Irvine Hse. Dec/74" and "ON ORIGINAL SITE"
Date stamped on slide mount reads: "[upside down] DEC 74"
Image from personal photograph album of Tom Irvine (Tommy Irvine). Photograph of four unidentifiable people standing in front of Tom Irvine's house. Image from personal photograph album of Tom Irvine (Tommy Irvine). Photograph of four unidentifiable people standing in front of Tom Irvine's house. Aerial photograph of Burnaby Lake and North Burnaby. 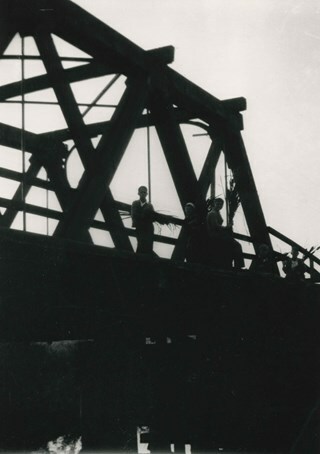 Photograph of five boys with bullrushes on the Still Creek Bridge, Douglas Road. 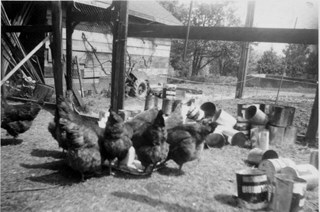 Photograph of chickens feeding at the Meyers' property at 5106 Douglas Road. 5106 Douglas Road later subdivided into 5539 and 5545 Norfolk Street. Note in blue ink on verso of photograph reads: "Chickens at Meyers 1950's / (Ernest and Magdalena Meyers) Residence / 5106 Douglas Rd." Note in blue ink on verso of photograph reads: "P.10"
Note in blue ink on verso of photograph (struck through) reads: "E.A. 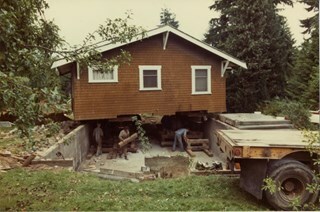 Meyers Residence ./ Photo by Pat Meyers / 1976?" 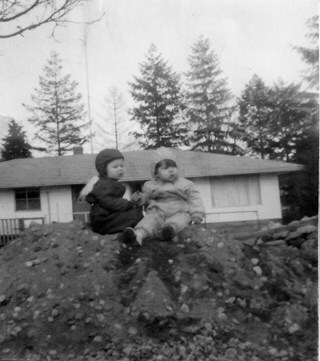 Stamp in green ink on verso of photograph reads: "734J"
Photograph of the Brocklebank children Brian and Pam, sitting on a dirt pile in front their single-storey house. 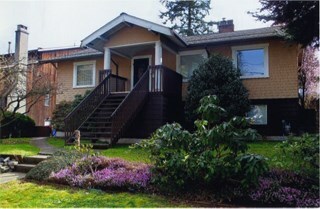 The Hardys sold the north half of their property at 3071 Douglas Road to the Brocklebanks who built the house in 1957. 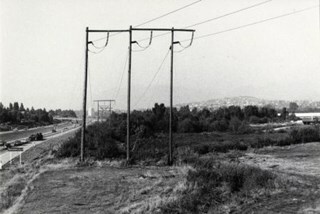 The photograph was taken from 5493 (previously 3107) Dominion Street, looking east. Note in blue ink on verso of photograph reads: "P.22"
Note in blue ink on verso of photograph reads: "Courtesy of [name]"
Photograph of the Hardy family's house located at 3093 Douglas Road. The photograph was taken from 5493 (previously 3107) Dominion Street, looking east. Note in blue ink on verso of photograph reads: "3093 Douglas Rd / "The Hardy's house""
Note in blue ink on verso of photograph reads: "P.23"
Note in blue ink on verso of photograph reads: "Photo courtesy of [name]"
Photograph of a house located at 3093 Douglas Road surrounded by trees. A rainbow is visible through a break in the trees. The photograph was taken from the south side of Dominion Street, looking north. 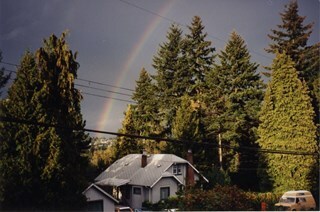 Note in black ink on verso of photograph reads: "Rainbow - Burnaby"
Note in blue ink on verso of photograph reads: "P.24"
Note in blue ink on verso of photograph reads: "1995 / 3093 Douglas Rd." 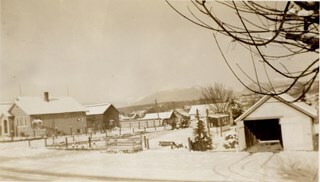 Photograph of the house and mushroom barns located at 3107 Dominion Street and the chicken house and garage at 3093 Douglas Road after a snowfall. 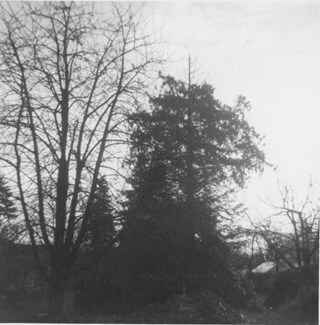 The photograph was taken from the Roberts' property, looking northwest. Note in blue ink on verso of photograph reads: "P.25"
Note in blue ink on verso of photograph reads: "3107 (5493) Dominion St. / Prob 1951"
Stamp in black ink of verso of photograph reads: "500"
3107 Dominion Street later renumbered 5493 Dominion Street and then subdivided into two lots: 5491 and 5495 Dominion Street. Photograph of Dominion Street, looking northwest from near Douglas Road. The house at 3093 Douglas Road is just visible between the trees. 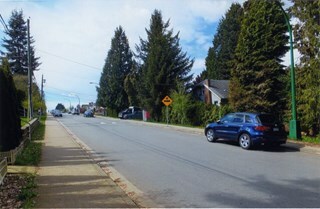 In 2009 Dominion Street was repaved and sidewalks were installed following a local improvement request to the City. Note in blue ink on verso of photograph reads: "P.27"
Photograph of the McLeans' house at 5493 Dominion Street (left) and the Brocklebank's house at 3071 Douglas Road (right). The photograph is taken from 5486 Dominion Street, looking north. Note in blue ink on verso of photograph reads: "P.30"
Note in blue ink on verso of photograph reads: "McLean's, Kamberg's, Brocklebank's houses. / Prob. 1965 or '66"
5493 Dominion Street was previously numbered 3107 Dominion Street and was later subdivided into two lots: 5491 and 5495 Dominion Street. 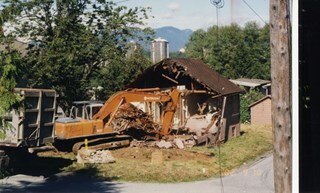 Photograph of the house at 5493 Dominion Street being demolished. The house was previously owned by the McLean family. The photograph was taken from 5496 Dominion Street, looking north. Note in blue ink on verso of photograph reads: "P.35"
Note in blue ink on verso of photograph reads: "Farewell [illegible] old house on Dominion Street"
5493 Dominion Street was previously numbered 3107 Dominion Street and it was later subdivided into two lots: 5491 and 5495 Dominion Street. Photograph of the back lane between Dominion Street and Norfolk Street. The lane is filled with trees, including a large cedar tree (centre) and cherry tree (left). The photograph was taken looking east along the lane. In 1965-66 the lane was put through from Douglas Road to Royal Oak and the trees and undergrowth were removed. Note in blue ink on verso of photograph reads: "P.2"
Note in blue ink on verso of photograph reads: "Old Cedar Tree - chopped down for alley - Fall - 1965"
Photograph of the back lane between Dominion Street and Norfolk Street, looking west. 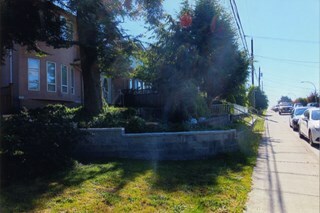 Visible along the Norfolk Street side of the lane are houses with garages and longer driveways. Along the Dominion Street side the lane is abutted by trees and open carports. 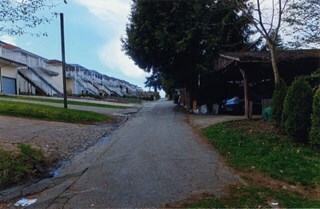 The houses along Norfolk Street were constructed in the 1980s and 1990s following the rezoning of the properties. 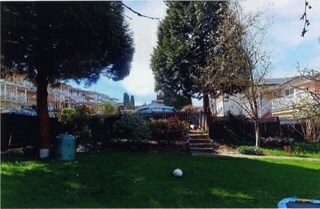 Note in blue ink on verso of photograph reads: "P.5"
Note in blue ink on verso of photograph reads: "April 1, 2015"
Photograph of the backyard at 5496 Dominion Street. 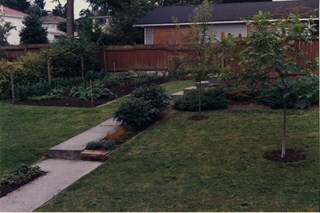 The backyard landscaping includes a cement pathway and vegetable garden. 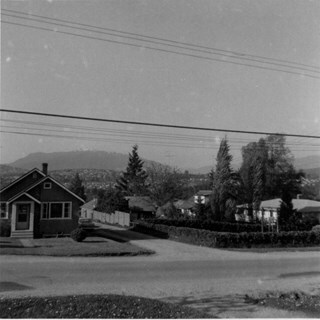 The photograph was taken from 5496 Dominion Street, looking south. Note in blue ink on verso of photograph reads: "P8"
Note in black ink on verso of photograph reads: "July 1989"
Photograph of the backyard at 5496 Dominion Street, looking south with the houses on Norfolk Street visible above the fence. These houses were built in the 1980s and 1990s following the rezoning of the properties. Note in blue ink on verso of photograph reads: "P9"
Note in black ink on verso of photograph reads: "April 1998 / 5496 Dominion St"
Photograph of the backyard at 5496 Dominion Street, looking west, with the houses on Norfolk Street (left) and Dominion Street (right) visible in the background. 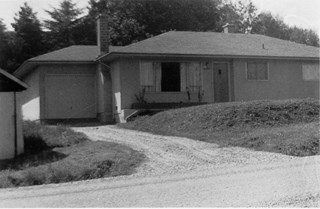 Note in black ink on verso of photograph reads: "April 1, 2015"
Photograph of a single-storey house with unpaved driveway located at 5486 Dominion Street. In 1954, John Roberts sold this lot to a builder who constructed the house and sold it. 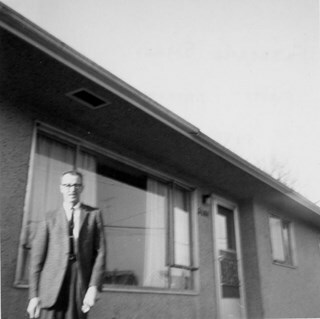 Note in blue ink on verso of photograph reads: "P11"
Note in blue ink on verso of photograph reads: "5486 Dominion St. / Probably late 1950s / Roberts' garage on left"
Photograph of Frederick Small standing in front of the house at 5486 Dominion Street. Frederick, who married Lauretta Roberts in 1945, purchased the house in 1955 and the Small family moved in. Frederick Small / Photo - Probably mid 1960's / 5486 Dominion St."
Photograph of the houses along Dominion Street, looking west from 5496 Dominion Street. 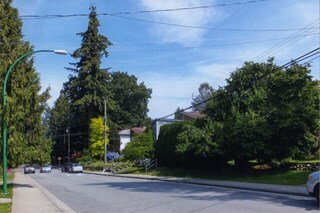 The two houses in the foreground, 5480 and 5488 Dominion Street, were constructed in 1994 on the lot previously numbered 5486 Dominion Street. Note in blue ink on verso of photograph reads: "P.16"
Note in blue ink on verso of photograph reads: "Houses at 5480 and 5488 Dominion St. / built in 1994"
Photograph of Dominion Street, looking east. The houses are largely obscured by tall hedges and bushes. 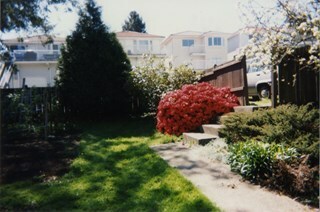 The photograph was taken from the north side of the street, opposite 5496 Dominion Street. Note in blue ink on verso of photograph reads: "P.19"
Note in blue ink on verso of photograph reads: "2016 / Looking East along Dominion St to corner of Douglas Rd. 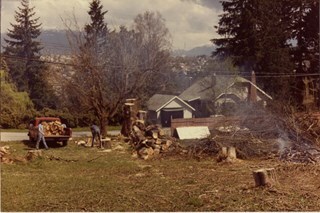 and Dominion St."
Photograph of the land being cleared at 5496 Dominion Street in order to create a path to move the Roberts' house onto the property. Included in the clearing are the stumps of two apples trees, a poplar tree, and a maple tree. The debris from the site was burned and smoke can seen rising from a small pile of brush on the right. 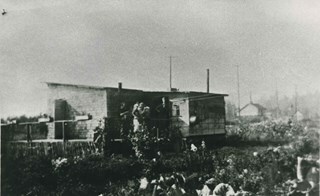 Note in blue ink on verso of photograph reads: "p.3"
Note in pencil on verso of photograph reads: "2"
Photograph of an excavator making a pathway to move the Roberts' house from 5538 Dominion Street to 5496 Dominion Street. 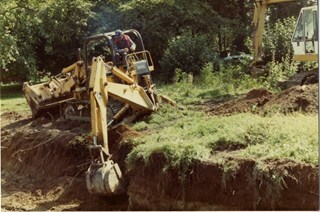 A second excavator works in the background. Note in blue ink on verso of photograph reads: "P5"
Note in black ink on verso of photograph reads: "3"
Note in pencil on verso of photograph reads: "4"
Photograph of the Roberts' house jacked up and supported by iron beams underneath. Three labourers work beneath the lifted house. In order to raise the house, some of the foundation was knocked down. A rear end of a flat bed truck is parked on the grass to the right. Note in blue ink on verso of photograph reads: "P.6"
Note in black ink on verso of photograph reads: "11"
Note in pencil on verso of photograph reads: "5"
Photograph of the Roberts' house nearly in its new position after being moved from 5538 Dominion Street to 5496 Dominion Street. The move took nearly two full days to complete. Note in black ink on verso of photograph reads: "25"
Note in pencil on verso of photograph reads: "8"
Photograph of the Roberts' house in its new position at 5496 Dominion Street. The house is jacked up and sitting on block to enable workers to build forms and pour concrete for the foundation walls. 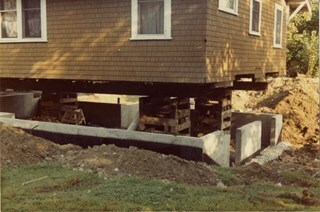 Note in black ink on verso of photograph reads: "15"
Note in pencil on verso of photograph reads: "9"
Note in black ink on verso of photograph reads: "Moving the house / Foundation Built, Waterproofed and Drainage Installed. 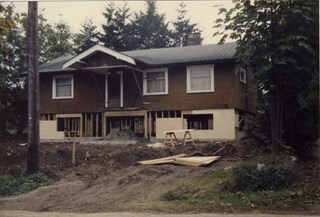 / Sept. 82"
Photograph of the Roberts' house in its new position at 5496 Dominion Street. Perimeter "pony" walls and other interior supporting walls were built to support the house. All of the plumbing and electrical wiring were replaced. Note in blue ink on verso of photograph reads: "B5 P11"
Note in pencil on verso of photograph reads: "10"
Note in black ink on verso of photograph reads: "Sept. 82"
Photograph of the Roberts' house in its new position at 5496 Dominion Street with an additional "cold storage" room added beneath the front porch and windows installed. Note in blue ink on verso of photograph reads: "B10 P12"
Note in pencil on verso of photograph reads: "11"